Toronto, Ontario (February 5, 2019) – SmartCentres Real Estate Investment Trust (“SmartCentres”) (TSX: SRU.UN) and the Penguin Group of Companies (“Penguin”) owned by Mitchell Goldhar announced today that they have entered into another joint venture with CentreCourt, to develop two additional Transit City Condo towers in SmartCentres Place at the Vaughan Metropolitan Centre (“VMC”). These two towers, Towers 4 and 5, will complement Towers 1, 2 and 3, the three 55 storey towers which were strongly received by the market in May 2017. SmartCentres and Penguin alone will also develop a sixth tower as a purpose-built rental apartment. The three new towers total approximately 1600 units, contributing to the burgeoning downtown core that Penguin and SmartCentres are actively developing. Towers 4 and 5 will be 50 and 45 storeys respectively while the apartment building will be 35 storeys. The three towers, designed by Diamond Schmitt Architects, will be located adjacent to the TTC subway station connecting SmartCentres Place directly to downtown Toronto. This phase includes expansive open green spaces designed by Claude Cormier & Associes. The open spaces are an integral part of the master plan at SmartCentres Place. “We have been overwhelmed by the positive response to Transit City Condos and anticipate that the market will continue to recognize the many positive traits of the 100-acre downtown core we are developing,” said Mitchell Goldhar, Executive Chairman of the Board of SmartCentres. “Adjacency to mass transit, open green spaces including our 9-acre central park and the community amenities make SmartCentres Place a very attractive place to live. This rental building represents an exciting new initiative into the rental residential sector for SmartCentres. We anticipate more to follow,” added Mr. Goldhar. “We are thrilled to continue our partnership with Penguin and SmartCentres with the launch of TC4 and TC5 this coming spring,” said Andrew Hoffman, Chief Executive Officer of CentreCourt. 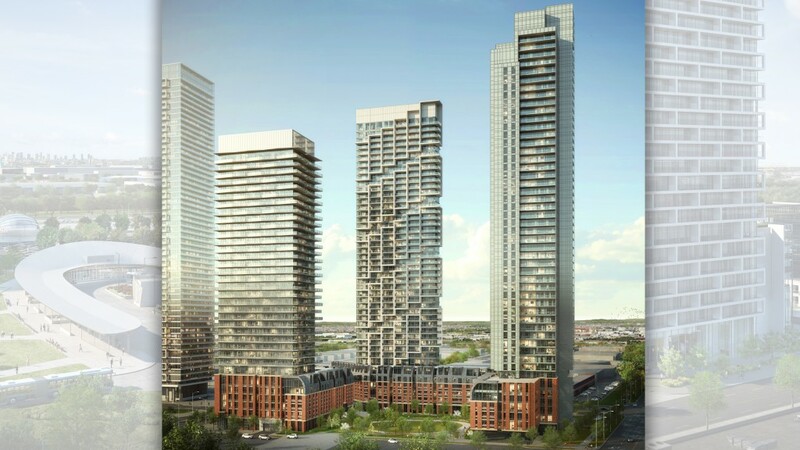 “These new residential towers will be in an ideal location in close proximity to the TTC subway, regional bus terminal, the YMCA, and all the other amenities of SmartCentres Place. Residents of TC4 and TC5 will also have direct access to 20,000 square feet of amenity space, accessible only to residents of TC’s newest phase – an unparalleled space for working out, swimming, relaxing and socializing,” added Mr. Hoffman. Marketing of Towers 4 & 5 will commence in the Spring and construction will begin later in 2019 after significant sales are achieved. Construction of Towers 1, 2 and 3 is well underway with the topping off the three 55 storey towers expected by the end of 2019, and closings anticipated in late 2020/early 2021. Construction is almost complete on the 220,000 square foot mixed use tower consisting of PwC as the lead office tenant, a 100,000 square foot flagship YMCA with child care and health and fitness facilities, and a 20,000 square foot City of Vaughan library and studio space to serve this rapidly expanding city centre. Occupancy is slated for late spring 2019. SmartCentres is one of Canada’s largest real estate investment trusts with total assets of approximately $9.4 billion. It owns and manages 34 million square feet of retail space in value-oriented, principally Walmart-anchored retail centres, having the strongest national and regional retailers as well as strong neighborhood merchants. The retail centres continue to experience industry-leading occupancy levels of 98%. In addition, SmartCentres is a joint venture partner in the Premium Outlets locations in Toronto and Montreal with Simon Property Group. SmartCentres Real Estate Investment Trust (“SmartCentres”) (TSX: SRU.UN) The Penguin Group of Companies (“Penguin”) is a private company owned by Mitchell Goldhar. Penguin owns real estate across Canada at various stages of development including an interest in the Vaughan Metropolitan Centre 100-acre master planned development. Penguin’s portfolio includes 12 properties co-owned with Walmart. Mr. Goldhar has also developed an emerging network of Penguin Pick-Up locations offering free, convenient pick-up locations for online purchases, and Penguin Fresh, an on-line food marketplace. The Penguin Pick-Up network now has 108 locations, including some co-branded with Walmart. For more information visit www.penguinpickup.com. CentreCourt is focused on the execution of well thought out high-rise condominiums located near all the major amenities of the Greater Toronto Area, rapid transit networks and employment areas. CentreCourt believes that this approach to development will contribute to the GTA’s vibrancy, sustainability and competitiveness. CentreCourt has completed nearly 2,000 homes in the past five years and is actively developing an additional 3,000 homes throughout the GTA. CentreCourt strives to exceed customer expectations and to be a leader in the real estate development industry. CentreCourt’s developments are collaborative endeavors undertaken with best-in-class planners, architects, interior designers and construction trades in order to ensure that the homes CentreCourt develops are of the highest quality standard. CentreCourt was behind the most successful condo launches in recent history including Peter Street Condos, Karma Condos, INDX Condos, Core Condos, Grid Condos, 411 Church Street Condos and Transit City Condos in Vaughan. For more information on CentreCourt, visit www.centrecourt.com.